I tried to microwave a hard-boiled egg yesterday. Ah. I can see half of you widening your eyes in anticipation, perhaps even starting to chuckle. Yes! Okay! I know! I actually did kind of know about exploding eggs in microwaves. I just didn’t know enough. I had peeled and broken my egg in two unequal parts, with the yolk showing, and I thought that would make it okay. About 10 minutes’ worth, is how much. There was egg white everywhere. Top, bottom, left, right, front and back. Tiny little itty bits of egg white splattered all over the walls of the surfaces, each bit claiming its own square inch. Luckily the yolk was still intact because it’s my favourite part! This morning, I googled how to reheat hard boiled eggs (because I still had more cooked eggs in the fridge). The advice is: Pour boiling water over your eggs and cover for 10 minutes. Then what is the point of making extra eggs to eat for breakfast! Sorry, I’m having a rant. I thought I was being clever cooking up three days’ worth of eggs in advance so I could save time cooking them the next two breakfasts! In the end, reheating eggs takes as long as cooking them from scratch, whether you take the microwave route or the sensible boiling route!! 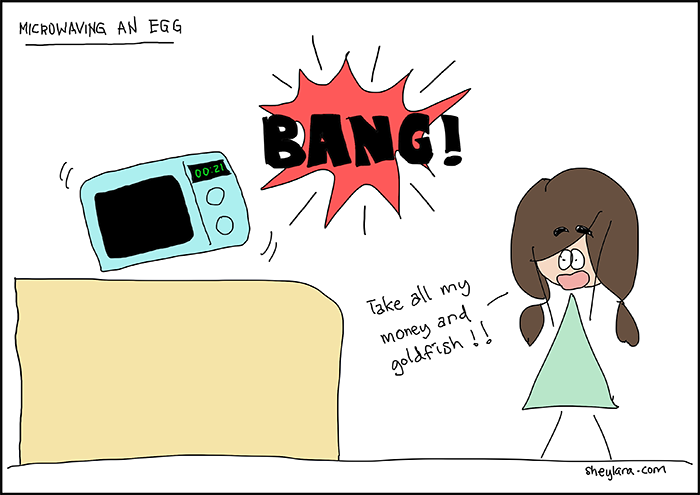 I could cover my eggs with a microwave lid so it wouldn’t make a mess, but the bang scares me, plus I read about eggs exploding into people’s face while they’re trying to eat them. Oh, HAHA. 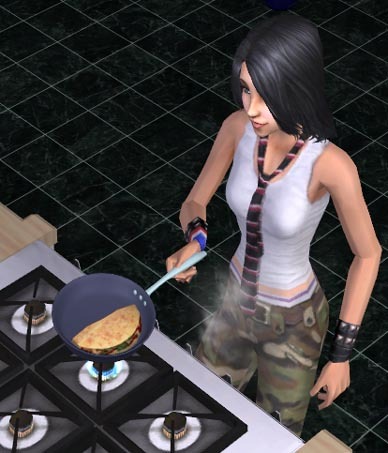 I just suddenly remembered I wrote a piece of poetry about omelettes 13 years ago. It’s my Ode to a Leftover Omelette. Read it here. Do you think I have a future as a poet, if not a cook? You should try sous vide for your eggs. 63 degree egg, perfect soft boil. I found out the hard way too.